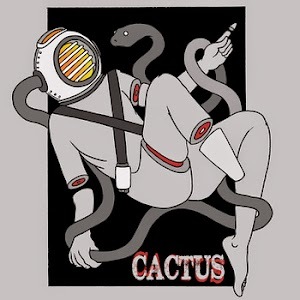 Cactus by Cactus is an album performed, recorded and mixed by Luke Chow and Ziad Samman at Little Bay Studios. It is made up of five really short songs generally around two minutes in duration. The first song ‘Mocking Bird’ starts off the album with a marching pop rock rhythm accompanied with vocals from Luke that you could expect to be in the next Muppets Movie. Sounding something like ‘ba da-da ba da-da ba’ and so on. It’s a great hook! I love it when I can sing along to a new song without knowing the lyrics. It helped me to get into the album straight away. I could just imagine Floyd Pepper from the Electric Mayhem singing the verse as Luke did. Their voices both sounding gravelly and deep. ‘Waiting For You’ is a slightly heavier rock song for the album. It began more like a sound check and I didn’t have much hope for the rest of the song. Then, it became more promising, especially when Luke started to scream “Just as long as I’m with you”. It returned to the baseline from the start which I did not appreciate at first, but sounded much better with the backing of all the instruments and vocals. With more and more plays I began to understand the song and like it more. I love the last 30 seconds of this song because it reaches its climax with some awesome vocals accompanied by an electric keyboard, but then it’s over. All too quick. The next song has some simple guitar chords that place you into a really relaxed mood. In ‘Flight of the Bird Man’ we get to go on a journey with Luke and Ziad through the clouds, over the seas and into their hearts. In this pop rock instructional style song we can have an out-of-body experience while listening to the hypnotic tunes of Cactus. ‘Looking At You’ is a more serious song. You can feel it from the outset. It’s more of a psychedelic song that reminds me of Pink Floyd. It begins with some guitar chords that would be suited to a Clint Eastwood Western before the outset of a gunfight. But, when you listen closer to the lyrics you realize that the song is about relationships. I would probably listen to this song a lot if I was heartbroken. The last song, ‘Kill the Night’ gives me more imagery of the lone gunman who is about to set off on some battle. This song was another psychedelic song that helps to round off the album by slowing down the tempo. The end puts another smile on my face as the vocals begin to wail like the ghosts of the night. It makes me want more, but at the same time it signifies the end of our journey of the album. Cactus by Cactus for me started off as an indie pop rock album, then the last two songs sounded more like psychedelic rock which made me wonder what I had been listening to before. I feel like some of the songs deserve to be longer, while others are perfect in length. All in all… It’s a nice really quick album that feels like a teaser of more to come from the duo.